The final testing phase of the new store system is almost over. After yesterday's stress test, the servers seem to be stable enough to handle the load of the release day. Also, there were some changes in how the currency is stored. Now, instead of paying directly for items, you can buy "Galactic Federation Credits" that can be used to redeem the items, be gifted to other players, or bid at the casino area. Also, the in-game store has been finally added. 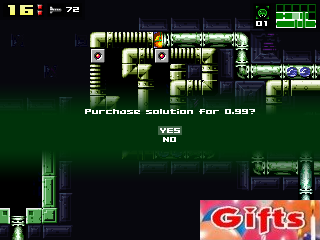 You won't have to minimize the game and visit the store page each time you run out of missiles. 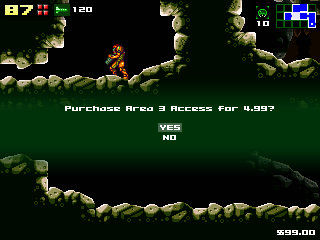 Now the entire AM2R item store is available from the pause menu. Right now all the support crates that contain the items spawn at the landing site, but there are plans to expand the drop locations. Bear in mind that the current store screens are in-development, there will be a better looking background and a bigger selection of items. Speaking of items, Reserve Tanks were added. These add 100 energy each, and are a permanent upgrade, available from the start of the game upon purchase. You can buy up to 10, and they stack with the normal E-Tanks. 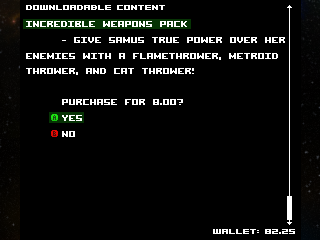 This ensures that the game will be accessible to people who aren't skilled at Metroid games, and wish to have a better starting loadout. Also, my accountant came up with a brilliant idea. 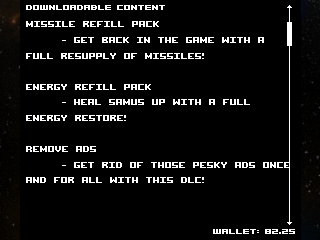 To make the optional contents even more optional!So, if you don't enjoy the first two areas, there's no point of making them available for free. 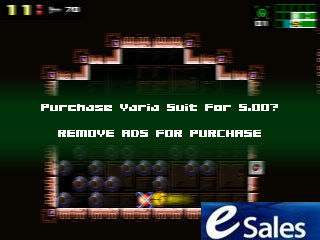 Also, both suit upgrades and the special VIP suit are even more optional than before, being accesible to the people who acquire the "AD Removal Premium Pack". This awesome pack also gives you a great 5% discount on all the hints/puzzle solutions. Now all the frustration of not knowing how to get that dodgy Missile Tank is a thing of the past! Now, the good news. During the first 24 hours after the release of the new demo, the game will be fully playable completely AD free. And as a bonus, Hard Mode will be free during the first day. You'll be able to enjoy all of these new features within the next few weeks, when the new demo is released.As always, positive comments, and product suggestions are always welcome. Edit: Thanks to the massive success of the new features, I'll be considering your awesome suggestions for more cool items. Post what weapon / item or feature you want to see in the game (along with an estimated price, of course). The top 3 people who suggest the coolest entries will receive a FREE season pass! Always love the "April Fool's" posts. Glad to hear the new demo is onl a few weeks off away. Keep up the good work. Brought to you by Coca-Cola, Monster and Visa! Absolutely love the effort you put into this April Fools joke. For about 30 seconds I was totally fooled and was thinking WTF!!!! Keep up the good work and the good spirit man. Working on a project this long tends to drain the life out of people, but you keep on going full strength. You're an inspiration to us all. sounds like the direction runescape is going! april fools wot! You know whats the sad part about this? When i saw the post, the first thing i thought was: "Happy april fools joke" Good one doc... good one. It's 2AM in the morning where I am, and I came here SPECIFICALLY to see your April Fools joke. Was not disappointed. Love ya, Doc! Thanks for all your hard work. I know I'm not the only one who appreciates everything you put into this. thanks for reminding me on why I skipped over the ps4 & the 1/3xbox. I didn't even blink when looking at this update. Finally! Now I can buy a solution for that puzzle! 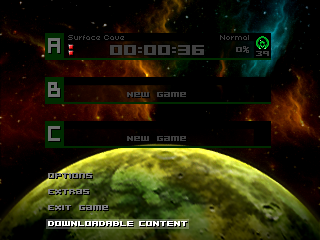 You should add a way to spend GFC to make enemies deal 25% of usual damage on Hard mode, and to make Samus run twice as fast as normal. Speed running isn't fair when there are people better than me at the game. I think 50 GFC would be a good prize! Time passes and every 1st April on AM2R is a lot of fun ! 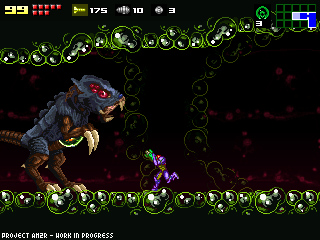 Take care and hope to see more of the True Metroid 2 Remake ! well also to the people that doesn´t has an account would be sad for the extra suits. Congrats, this was the only April fools joke I got fooled by this year. Speaks volume about the game industry when something like this, even in it's absurdity, still doesn't feel that far from the norm. Que tal la compra de actualizaciones para misiles, cuando no se sabe a donde ir, comprar pista de a donde ir y la compra de habilidades como: morph ball, etc. so there isn't gonna be DLC, and all that? that's good. that would ruin the game in my opinion. r we supposed to buy the new areas? cuz I'm not doing that until the full game is released. Did you notice missing enemies in this project?